Place asparagus on a sheet pan and top with olive oil, salt and pepper. Using hands, lightly toss to coat and spread asparagus out in single layer on sheet. Remove and set aside to cool to room temp. Meanwhile, shell fava beans and parboil in lightly salted water for 1 minute. Remove to an ice bath to cool for 5 minutes. In a small bowl, whisk ingredients for vinaigrette (lemon juice through honey), until honey is complete dissolved. Slowly whisk in olive oil, until fully incorporated. In another small bowl, mix goat cheese with lemon zest and honey. Set aside. 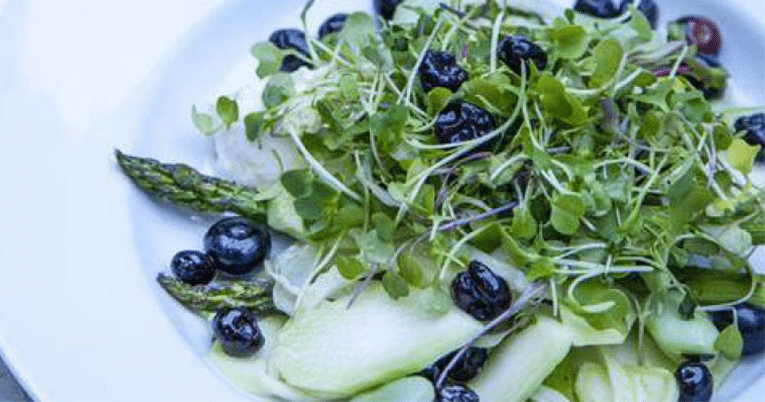 In a larger bowl, combine sliced broccoli stems, fennel, fresh and dried blueberries and cooled beans. Lightly toss with prepared vinaigrette. Assemble plates by first placing a dollop (or “cannelle”) of goat cheese just off center on plate. Arrange 4 to 5 spears of broccoli around cheese. Spoon dressed veggies in and around plated ingredients. Top with handful or two of microgreens. Place a few dried blueberries on top of greens for garnish. Serve immediately.